Durable and lightweight, this 30-pack of Infant and Toddler Hangers from Delta Children will keep your little one organized with style. Sized for small garments (newborn-toddler), they feature an ultra-slim design that saves an amazing amount of closet space — freeing up room for even more adorable outfits! 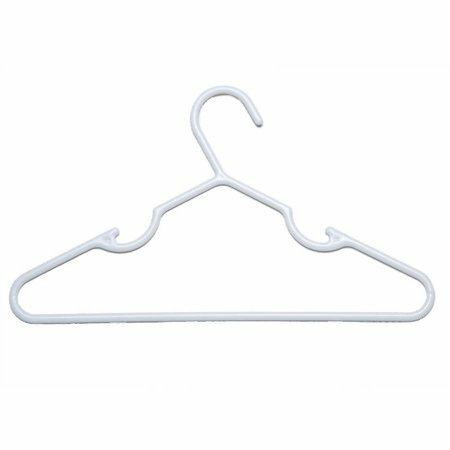 There is really not much one can say about a hanger—either they are made from great quality or they are poorly made and wouldn't withstand the weight of a tissue. After receiving these hangers, I must say that I was quite impressed. My granddaughter has a lot of clothes and while we had some hangers, the remaining hangers which came with the clothes were flimsy and would break easily. With these hangers, we can hang her jeans without worry. Also, it has allowed us to better organize her clothes. Some of her older clothes fit well on the hangers without falling off as some toddler hangers do. We have bought her up until a Girls Size 6/7 and they still fit well on the hanger. In my opinion, these hangers can be utilized at least through Kindergarten/1st grade before switching over to larger sized hangers. I would recommend them. I am submitting this review for the Spark Reviewer Program. This order was supposed to be 30 Delta Children, Infant & Toddler hangers. What I received was 30 boxes of Delta Children, Infant & Toddler hangers! My problem now is, what to do with all of them? We use these small hangers to hang jeans & slacks on. They are also good for tank tops & spaghetti strapped shirts. With the indention & the little grabby things, sleeveless shirts don't fall off. Since these are smaller, I'm thinking they will be good to use in the closets of our travel trailer. Our tank tops, spaghetti strap shirts & swim suit tops will hang nicely. Our daughter is expecting her first baby, so she will get some of these, also. The last time I had something like this happen, I had ordered 6 camping chairs. What I received was 6 boxes containing 4 chairs each. A total of 24 chairs! I put the extras of these to use, also. I donated them to our ministry. 174(I had called Walmart to tell them of their error. They had said keep them) I would think Walmart would be having issues with their inventory, when these things keep happening. Was a bit thrown off by the reviews but.. Typical kids hangers.. does the job.. 60 count (I purchased 2) for under 30 bucks.. can't beat that! Fit my 2 year olds clothes just fine. They are on the thinner side so maybe that's why people think it is cheap but it doesn't bend or break (at least not for me) so no complaints here. I ordered these to display 18" doll clothes at craft fairs. They are sturdy and wash up easily. I cut them down where the hangers come back up after the slot for straps. Be careful if you order online. I asked for a box of 30 hangers and received 30 boxes of 30 hangers. That is 900 hangers. I will be donating a lot of hangers in the next few weeks. These are just what I was hoping for; straightforward as the adult version but in a size thats perfect for an infant's cute onesies and pj's. I didn't "love" this product but they work. The hook of the hanger seems a little small but they work. These were the right color and style of hanger that I needed, but they are thin and not the greatest quality. That is probably why they are so inexpensive though.